Rock like Spock in these officially-licensed Star Trek earbuds, complete with pointed Vulcan ear tips! This functional accessory features a built-in microphone that allows you to handle both phone calls and media listening in style: accept and stop calls, as well as play, stop and skip between audio tracks! 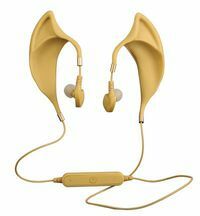 The Earbuds feature flexible rubber ear tips for maximal comfort and a choice of 3 (three) ear bud sizes. This functional accessory features a built-in microphone that allows you to handle both phone calls and media listening in style, with in-line volume control! It's only logical! Choose from Bluetooth or Wired versions. Legal Notice: Entire contents trademarked (® or TM) and copyrighted (©) 1986-2019 by Things From Another World, Inc. and respective copyright and trademark holders. All rights reserved. Page rendered at 2019-04-25 21:45:48 in 0.436 seconds.